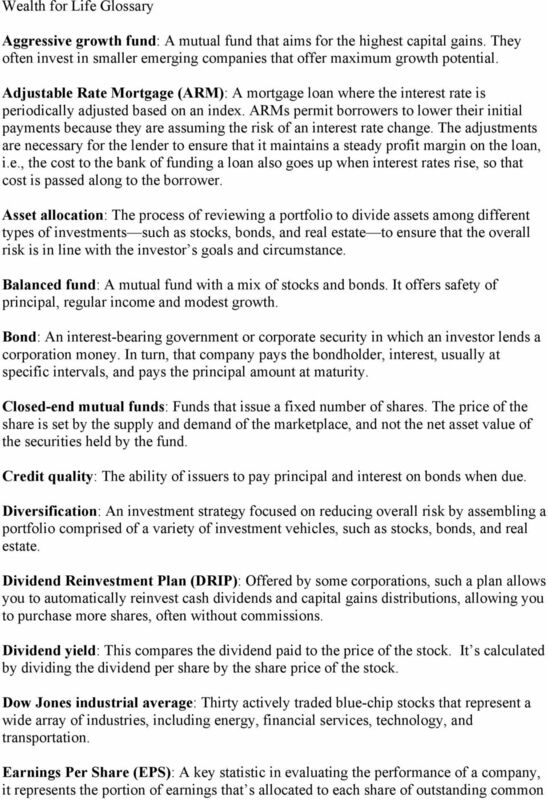 Download "Balanced fund: A mutual fund with a mix of stocks and bonds. It offers safety of principal, regular income and modest growth." 2 stock. For example, a company that reported earnings of $1 million, and that had 2 million shares outstanding, would report earnings of $.50 per share. Analysts earnings estimates are a key indicator of their outlook for a particular stock. Emerging market fund: A mutual fund that invests primarily in countries with developing economies they tend to be more volatile due to political instability and currency fluctuations. ETF (Exchange Traded Fund): an investment vehicle that trades like a stock, but holds a basket of stocks or bonds. Some ETFs track indexes, others have holdings that follow a particular theme, with investments in gold or currencies. ETFs are similar to mutual funds in that they represent a collection of investments. Unlike mutual funds, ETFs trade on an exchange (hence the name). Some investors prefer ETFs to mutual funds because they have low expense ratios and generate lower capital gains taxes than similar mutual funds. Expense ratio: This figure reveals how much a mutual fund charges for its operating expenses. It s expressed as a percentage of the fund s total assets under management. For example, a fund with an expense ratio of 1.05%, charges $1.05 for every $100 it has under management. The Federal Deposit Insurance Corporation (FDIC): An independent agency of the U.S. government that insures depositors of up to $250,000 per bank, for each account ownership category, as long as the bank is a member of the firm. FICO score: Though there are several measures of creditworthiness, FICO scores, issued by the Fair Isaac Corporation, are the most widely used. Scores range from 300 to 850 scores above 700 are a very good sign of strong financial health. Fixed-income: A type of security that pays a fixed rate of return. It usually refers to corporate, municipal, and government bonds, which pay a fixed interest rate until the bond matures, and to preferred stock, which pays a fixed dividend. 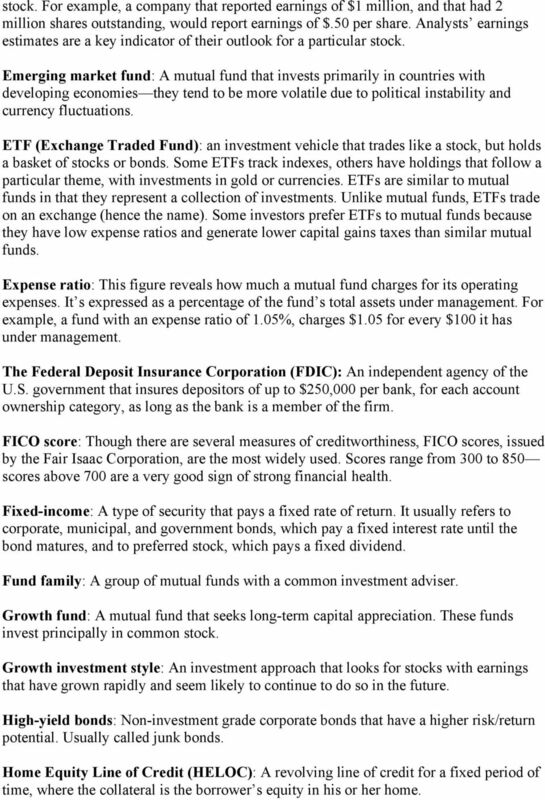 Fund family: A group of mutual funds with a common investment adviser. Growth fund: A mutual fund that seeks long-term capital appreciation. These funds invest principally in common stock. Growth investment style: An investment approach that looks for stocks with earnings that have grown rapidly and seem likely to continue to do so in the future. High-yield bonds: Non-investment grade corporate bonds that have a higher risk/return potential. Usually called junk bonds. Home Equity Line of Credit (HELOC): A revolving line of credit for a fixed period of time, where the collateral is the borrower s equity in his or her home. 3 Index fund: These mutual funds invest in securities tied to an index, such as the S&P 500. Index funds seek to have their returns equal the performance of the index. Keogh plan: A retirement plan for self-employed individuals, sole proprietors or partners in a business and their employees. Ladder: A bond portfolio strategy where investors stagger the maturities of their holdings in order to provide a regular income stream as the bonds come due. Large cap: Describes the market capitalization of the largest companies generally regarded as equal to $5 billion or more. Limit order: When you place a limit order, you specify the highest price you re willing to shell out for shares if you are in the market to buy, and the lowest offer you d be willing to entertain if you re selling. If the broker can t meet your price or do better, the order won t be executed. Liquidity: The ability of an individual or corporation to convert assets into cash or cash equivalents without significant loss. Load: A sales charge paid by an investor who buys shares in a mutual fund that is sold by a brokerage firm or other sales representative. Market capitalization: The value of a corporation determined by the market price of its outstanding common stock. It is calculated by multiplying the number of outstanding shares by the current price of the shares. Market order: A market order is an instruction to buy a certain number of shares at the best price available. Maturity: The date on which a bond or other debt instrument becomes due and payable. Mid cap: Describes the market capitalization of mid-size companies generally regarded as being from $1 billion to $5 billion. Mutual fund: A professionally managed fund that pools the money of its investors to buy a variety of securities. NASDAQ: The National Association of Securities Dealers Automated Quotations system is the largest U.S. equities exchange. With a total of approximately 3,200 companies, it lists more companies and, on average, trades more shares per day than any other U.S. electronic market. The NASDAQ is owned by The Nasdaq Stock Market, Inc. (NDAQ). Nasdaq Composite Index: An index that tracks all of the stocks traded on the NASDAQ stock market. It s widely followed as an indicator for the performance of technology companies. 5 price at which your broker has instructions to sell shares. For instance, if you purchased shares of Apple Inc. at $20, and the stock climbed all the way to $90 per share. If you then placed a stop loss order of $70 on the shares, as soon as the stock falls to $70, your broker will sell them for you. Used effectively they can help protect your profit, or at least help minimize losses on a plummeting stock. Treasuries: Bonds, notes and bills issued by the U.S. government and backed by its full faith and credit. Value investment style: An investment approach that looks for stocks whose market price appears to be less than the intrinsic value of the company. Yield: The percentage rate of return on the principal invested by the holder of the security. Asset Allocation Fund: Mutual fund that holds varying percentages of stock, bonds, and cash in its portfolio. Investments. To meet your financial goals you will need a plan. Part of this plan is to create a portfolio. About Hedge Funds. What is a Hedge Fund? 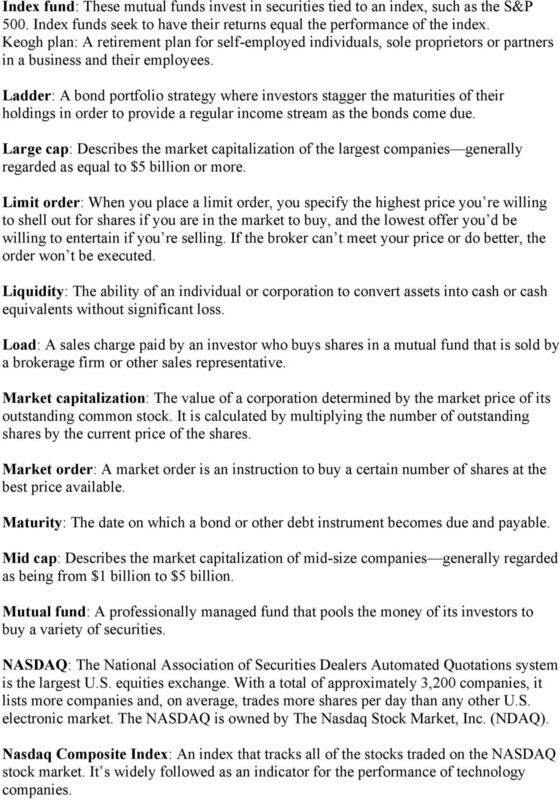 Types of Stock. Common Stock most common form of stock. Preferred Stock. Companies may customize other classes of stock. 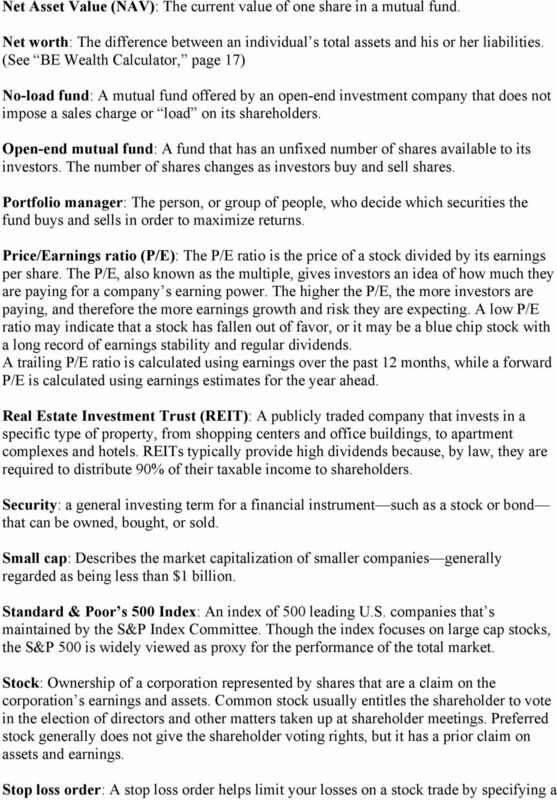 Stock Market Basics What are Stocks? Stock is ownership in a publicly traded company. Stock is a claim on the company s assets and earnings. The more stock you have, the greater your claim as an owner. ANNUALIZED RETURN The average amount of money earned by an investment each year over a given time period.